It’s hard to believe that much of Western society draws its cues from a country just a little smaller than Alabama. Of course I’m referring to Greece, commonly understood to be the cradle of modern Western civilization. In addition to technological innovations such as watermills, lighthouses, odometers, accurate mapping, the Olympic Games, cranes, and even showers, the Greeks contributed their pantheon of gods, goddesses, demigods, and monsters that make up Greek mythology. Few areas of Greek society have had as much impact on Western culture as the mythos surrounding ancient Greece. The gods of these stories are powerful, brave, and more than a little capricious. Wise Athena gave Greeks the olive tree, strong and handsome Apollo gave us medicine and music, speedy and gossipy Hermes god of trade and guide to the Underworld, and many more. Mythology claims that Santorini was initially created from a mound of dirt thrown into the sea by Euphemus the son of Poseidon. 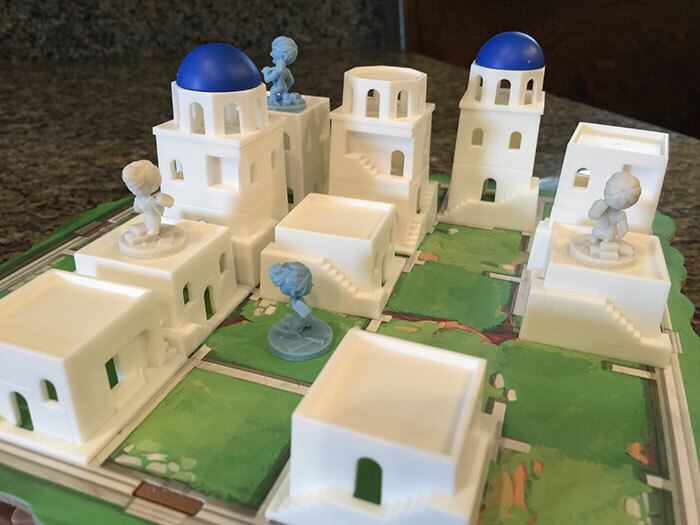 Of all the cities in Greece few of them are as lovely and pristine as Santorini, the setting for the strategy game of the same name, and where we begin our review. 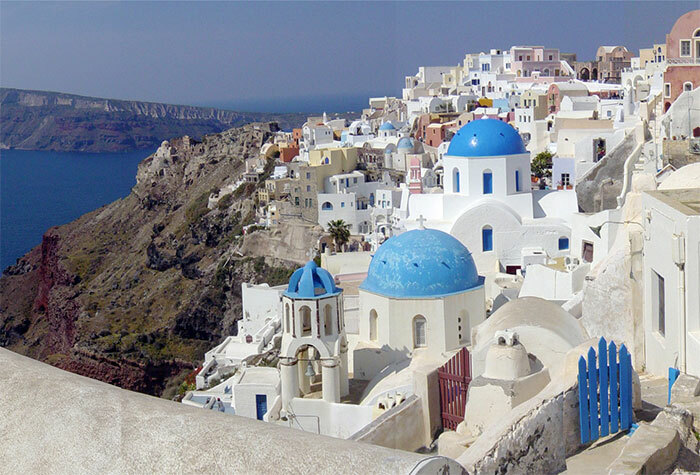 Santorini is set on a playing field in the ancient city of Santorini, known far and wide for its whitewashed stucco surfaces and brilliant blue domes overlooking the Mediterranean Ocean. Players will select one deity from a pantheon of gods, goddesses, and demigods and use that deity’s special ability to outmanueveur and defeat their opponents. Setting up Santorini is relatively easy. 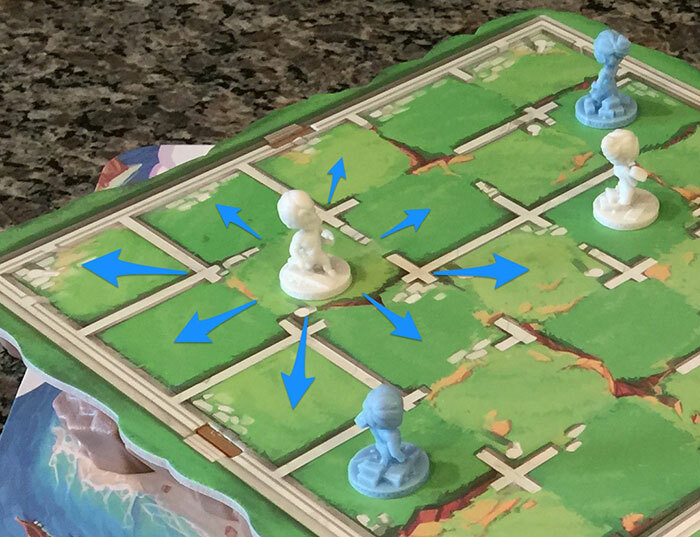 Remove the 3 parts of the playing board: the wide base, the brown plastic riser, and the smaller gridded board where game play will take place. Each player should select a pair of workers of the same color (unless you’re playing a 4 player game). Shuffle the deck of “god cards” and allow each player to select one. For your first few plays the publisher recommends that players choose from the beginner set of 10 god cards, so indicated by the purple hibiscus flower located in the bottom right corner of the card. Separate the bottom, middle, top, and dome building pieces into piles. Select a first player, and in turn order place both of your workers onto the 5×5 grid in any desired location. You’re now ready to begin. The goal of Santorini is to end your turn with one of your workers on the 3rd floor of any building on the board. To accomplish this players will move their workers around the board, and build structures allowing them to ascend. Some god cards provide specialized win conditions notated by a laurel wreath. Turns in Santorini are simple. 1) Move a worker – A worker may move to any of the spaces directly adjacent to it, including diagonal. Players may ascend one level at a time, but may descend any number of levels. Players may never occupy the same space as a dome or another player piece. 2) Build – The worker who was moved may construct a building in any of the spaces directly adjacent to it, including diagonal. Note that the appropriate building piece must be used. First floor, second floor, third floor, and dome pieces lock together to make picking the correct piece easy. Players alternate turns until one player has fulfilled either the base win condition, or their god card’s specialized win condition. Due to the restriction on moving up one level at a time it is possible for player pieces to become trapped. If this happens, whichever player still has worker pieces that can move is declared the winner. It’s probably worth a section to discuss the god cards in a little more detail. All god cards provide a unique special ability given to that player for the duration of the game. These special abilities all break the basic rules of the game in some way. In general the god cards abilities fall into 3 main categories. 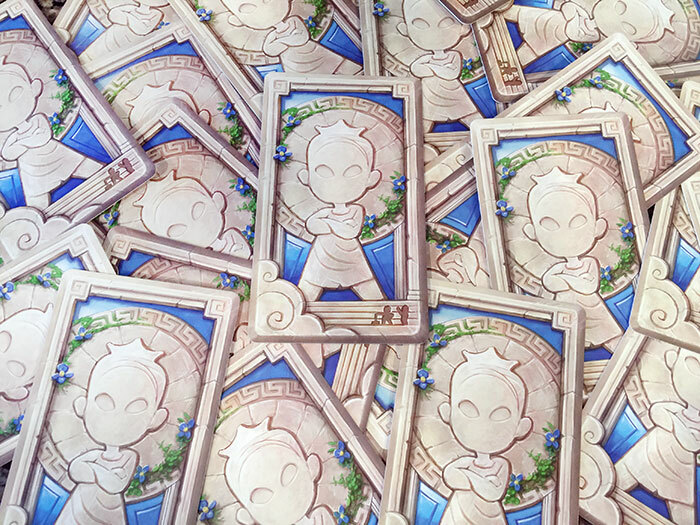 Alternate movement – Cards like Hermes and Athena allow players to move their workers in specialized ways. Cards like the Minotaur allow players to actually affect the location of opposing players. Cards like Apollo allow players to literally swap positions with the opposing player. Specialized win conditions – Cards such as Eros and Pan provide an extra win condition to players. For example, Pan wins a match if he is able to step down from a second story building. Removing opposing workers – Certain cards such as Bia and Theseus actually allow players to remove opposing workers from the game completely. Pay close attention to your god card ability as their can be some really bizarre matchups. In a recent game against my daughter, we played the combination of Eros and Circe. Eros allows players to win if both of his workers are even next to each other on the first or second floor of a building. Circe’s special ability is that she gets to use the opposing player’s special ability unless that player’s workers are next to each other. That meant that my daughter, who was Circe, was able to use Eros’ special ability any time, unless his workers were next to each other, in which case Eros would win. 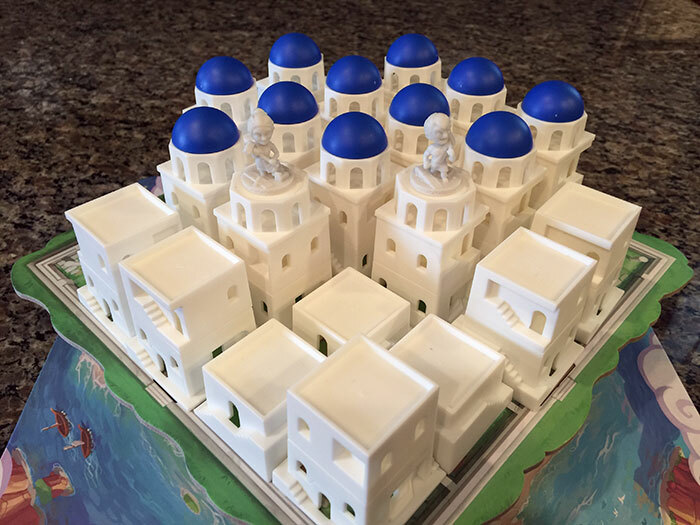 Santorini is a beautiful and wonderful strategy game in the same vein as chess. While it doesn’t have the same depth, players must constantly be planning multiple moves ahead to be successful. The artwork for the game is vividly colored, cartoony, delightful, and communicates the theme with perfect clarity. The building blocks are wonderful; so tactile and fun to look at. My kids and I played with them after every game just to build cool towers. 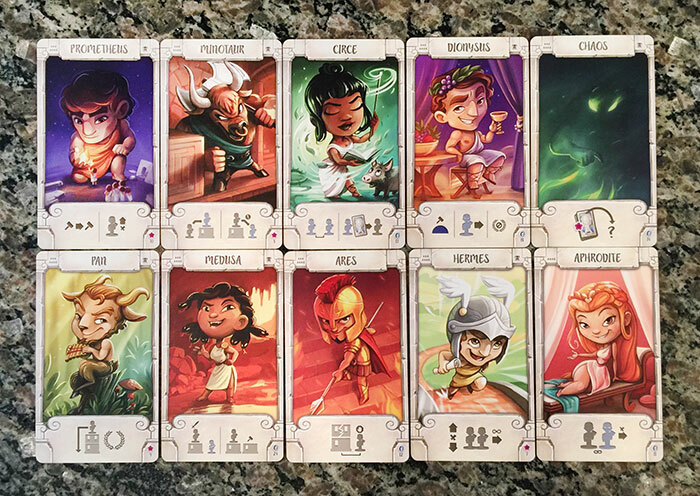 The god cards turn a moderately interesting game into a masterpiece. The cards are well balanced and after revealing your cards each player will likely wish for the other player’s power. The base game includes 30 god cards which allow for a dizzying array of combinations. I didn’t explore outside the beginner set of cards for until after my first 10 games. This should give you an idea of just how good the game is. I didn’t even care about the advanced powers! I’ve said before that no game is perfect. Santorini is pretty close, with only a single gripe. When setting up the playing board, the brown riser has tabs on both top and bottom which allow it to slot into the bottom and top boards securely. 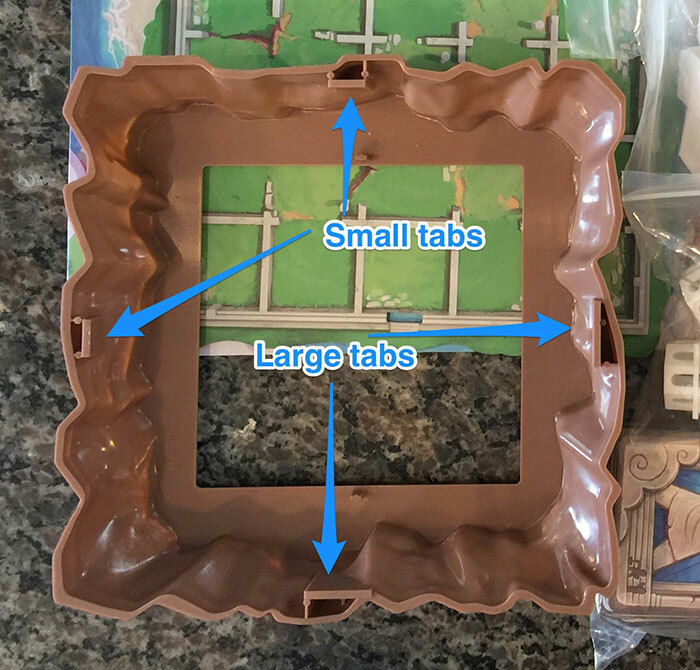 For some reason Roxley Games made two of each of the tabs a different size. This means that you must pay attention to the way in which the board fits together. I’d love to find out why they chose to do this as it really does make assembling the board more complex than it needs to be. 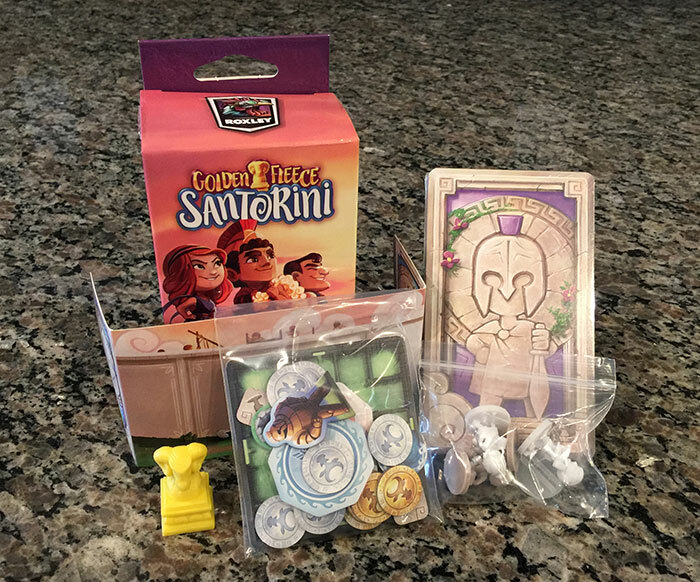 Santorini began life as a wildly successful Kickstarter, raising over $700,000 canadian dollars. Backers received a number of goodies built into their pledge. Packaged for retail sales as The Golden Fleece expansion, this upgrade adds a number of new god cads, hero cards, and several alternate ways to play the game; all in a tiny attractive package for only $15. 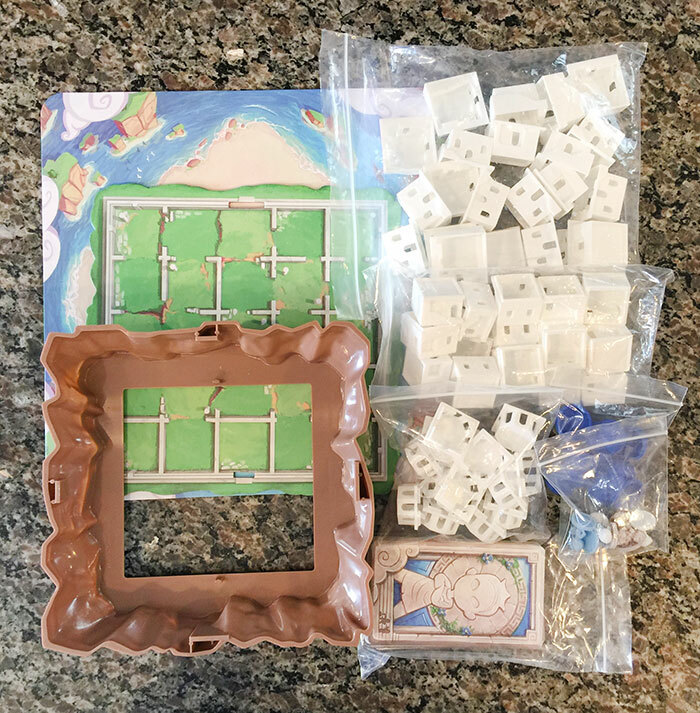 This is easily worth the money and adds so much more variety that you could play Santorini every day for a year and never play the same game twice! Santorini is abstract in it’s game play, but far from abstract in it’s presentation. 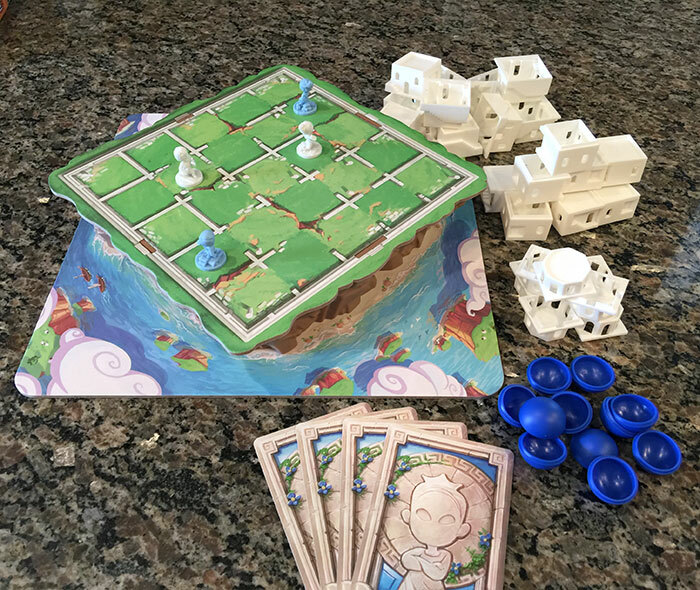 It features a stunning 3 dimensional board rising several inches off the table, chunky building blocks which allow players to construct the towering buildings from the city, and a beautifully illustrated deck of “god cards” which depict many deities from Greek mythology including a number I’d never heard of. 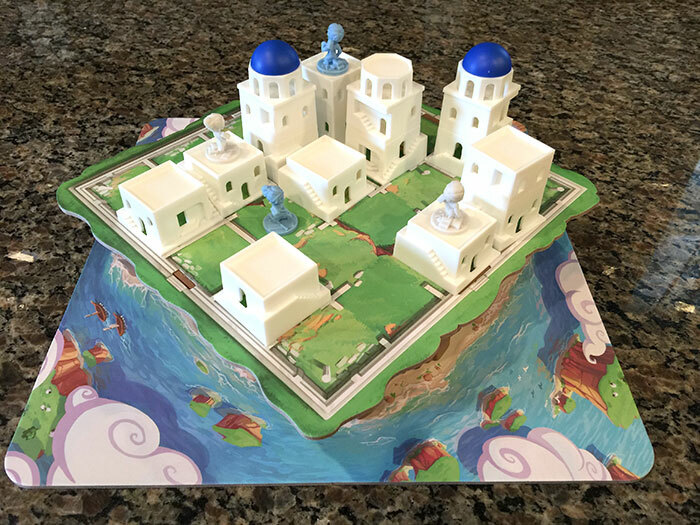 If you enjoy abstract strategy games, or Greek mythology, or heaven forbid BOTH, then Santorini is a must own. Play it with your kids, play it with your friends, play it with total strangers, then get them to buy it themselves and have them repeat the cycle. I’m calling it right now, Santorini will be nominated for a Spiel des Jahres award (the highest award in board gaming), and might even win it. What do you think about Santorini? Give us your opinions about what you like and/or dislike about the game in the comments below!